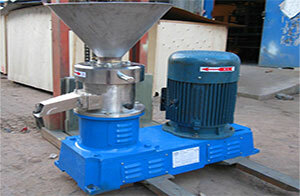 Peanut butter production machine is used for grinding peanut, sesame, almond, etc into paste. The machine composed by the transfer teeth, given teeth, impeller, drive motor and other components. Set of heterogeneous machines, grinders, blenders and other mechanical performance in one, with a compact structure, fine grinding. Peanuts baked at high temperature, peeling, grinding peanut butter made from juice, add a stabilizer made of stable peanut butter, add flavor material flavor of peanut butter is ideal peanut and sesame butter processing equipment. Easy to use, simply pour the peanuts into the machine and turn the dial to your desired setting. It’s biggest advantage is high yield, and at the same time can directly put the whole peanuts lapping into a sauce. Applied to peanut milk, albumen milk, soy, wheat and dairy products, milk, essence, various beverages, Aloe Vera and so on. Grinding paste machine is a new equipment by introducing the latest technologies of wet-type particle processing method, and is mainly used for a variety of peanut butter (standard, smooth-tasting, authentic, savory, spicy, etc.) and sesame paste grinding. Compacted structure, stable working, low noise, rust-proof, easy to clear and maintain.